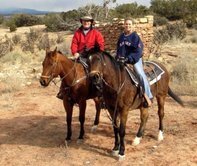 Ride the New Mexico countryside with Annie! What a wonderful experience and truly enjoyable trail ride with excellent well trained horses Wild high country desert scenery.complete with hills, creeks, sage, arroyos and coyotes!! Very casual and enjoyable ride as Annie is a local “personality” and keeps the ride going with interesting banter. Annie also has Yaks, a mule, and other various animals she tends for as a refuge. A woman with a real “heart” and compassion for animals as well as humans. A visit to her ranch is always an interesting experience..